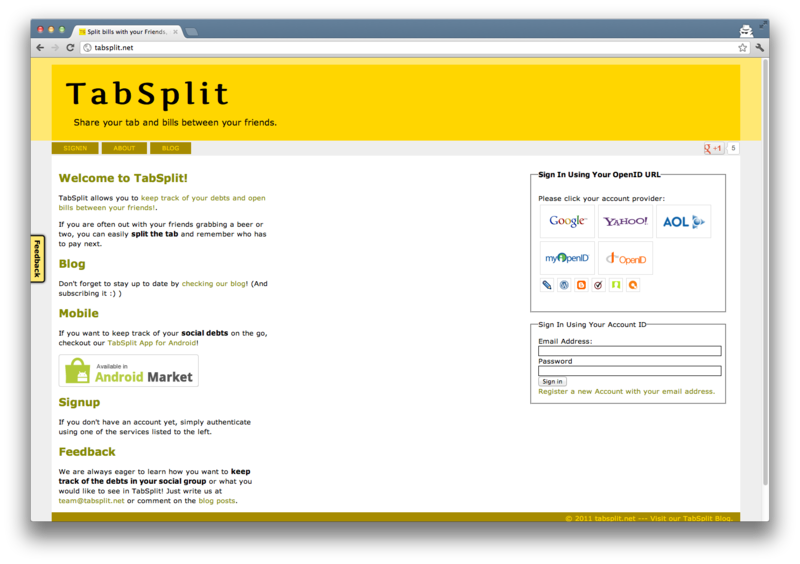 TabSplit Blog | Share your tab and bills between your friends. Share your tab and bills between your friends. Reduce debts between your friends: Shuffle Debts has arrived! Posted July 15, 2014 by Herby & filed under TabSplit News. We can finally deliver a long requested (and promised) feature: You can now shuffle debts between your contacts to reduce overall debts! It is very common that within a group of friends, if you have made a handful of payments together that everyone had some kind of transactions with everyone else in the group. Which results in many small “debt connections” between everyone in this group. To make it possible to reduce the number of debts between contacts you can now easily “shuffle” around debt. The overall amount of your debt vs. credit will stay the same, but the number of transactions required to get everyone even usual reduces drastically. I want to shuffle, now! Everyone who is affected by a shuffle transaction has to confirm it, before it takes effect. Posted June 8, 2014 by Herby & filed under TabSplit News. 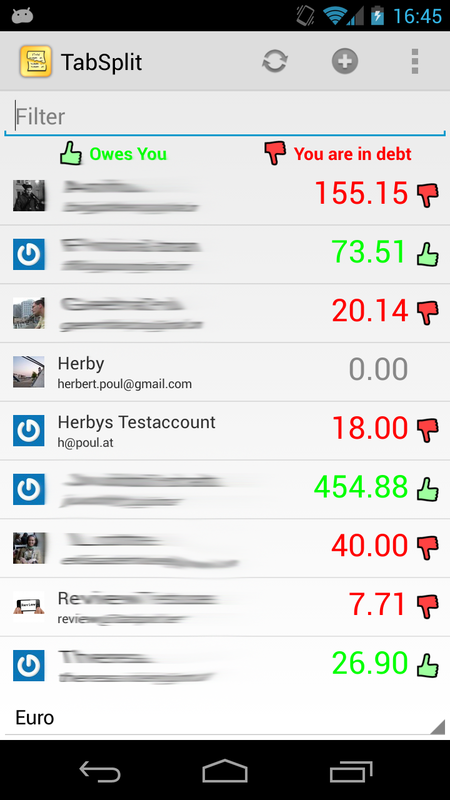 We just pushed an update to the way we display balance history for specific contacts. In your contact list you can view a balance history to see all transactions you had involving the given user and how the debts were affected by each transaction. In this new version we now both, simplified this view and extended it. Previously the list only included the balance at any given point in time. 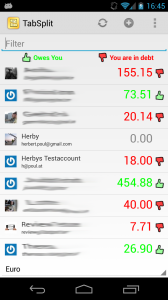 You can see the “share” of the given user listed in the “delta” column. Posted April 5, 2013 by Herby & filed under TabSplit News. Billmonk was recently acquired by BillPin and as former Billmonk users we were very exited to see who acquired Billmonk and check out their innovations. Unfortunately we were quite disappointed about their current feature set. We hope that the money(?!) behind their company will make it as good as they promised. 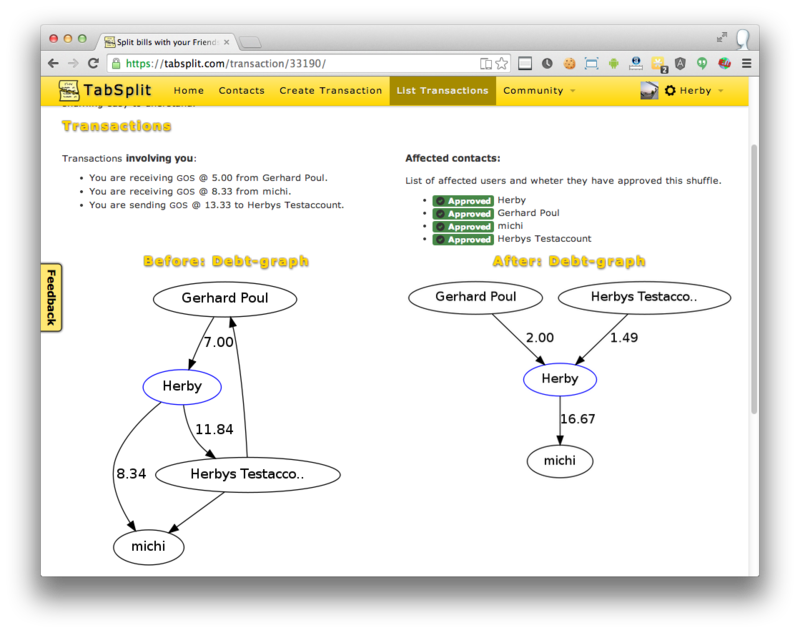 Nevertheless, if you want to move from Billmonk to TabSplit, the time is now. We expect that our Billmonk import will eventually die with the acquisition. So if you want to continue to use Itemized Bills (Tabs), reliably, fast and on your Android phone, come and join TabSplit. We also provide an open API which makes it possible to support more platforms. 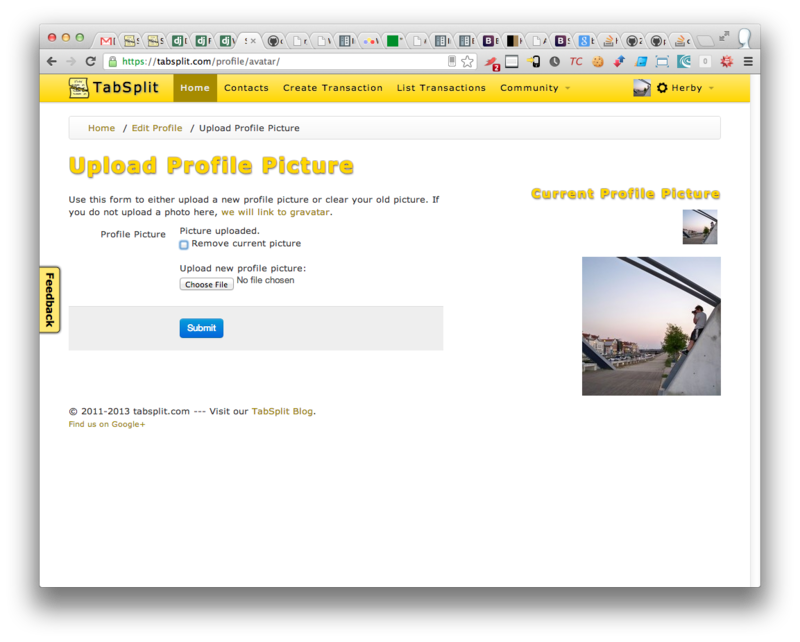 Also visit our open source project for a TabSplit iOS App – the app currently only has read-only features, but we appreciate any contributions. 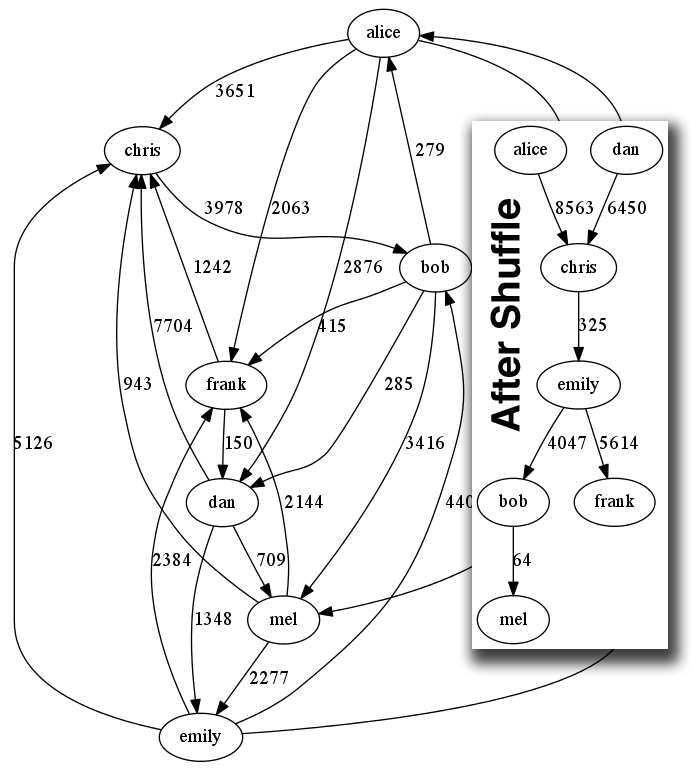 We have also implemented shuffling debts in an improved version known from Billmonk. Although it is still under development be prepared to use it soon. See the image to the left for an example – Many former Billmonk users will certainly remember those graphics. 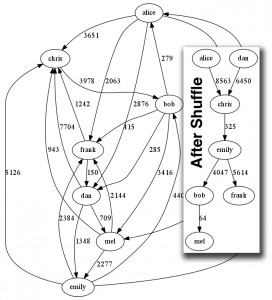 These will also help explain you how the shuffle worked right inside TabSplit. If you need any assistance just let us know in the forum and we will come back to you. Also: Expect a much better mobile experience in the coming months! You won’t believe how much we can improve our existing bill input. 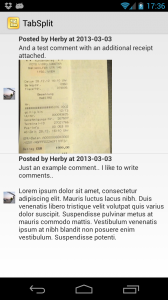 Posted March 3, 2013 by Herby & filed under Android App. 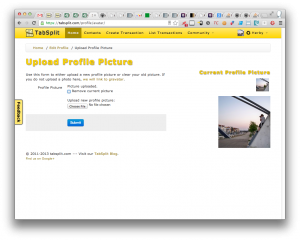 Synchronization of the newly introduced comments: Through the web interface it is possible to add comments and photos like additional receipts to a transaction. These are now synchronized to your mobile phone and can be viewed. (Images are only downloaded on demand, so you have to be online to view them.) – See the screenshot below for an example. Show progress during initial Synchronization. Posted February 25, 2013 by Herby & filed under TabSplit News. It is now possible to add additional photos (e.g. of receipts) or comments to transactions. Previously the only way to add a receipt was by creating a Tab (itemized bill) – but now you can simply create a payment, or joint payment and later attach a photo, file or comment afterwards. Currently this is only possible through the web interface. Posted February 22, 2013 by Herby & filed under TabSplit News. We have also cleaned up the Account Preferences, moved password change form into it’s own page, etc. Hope you like those changes. 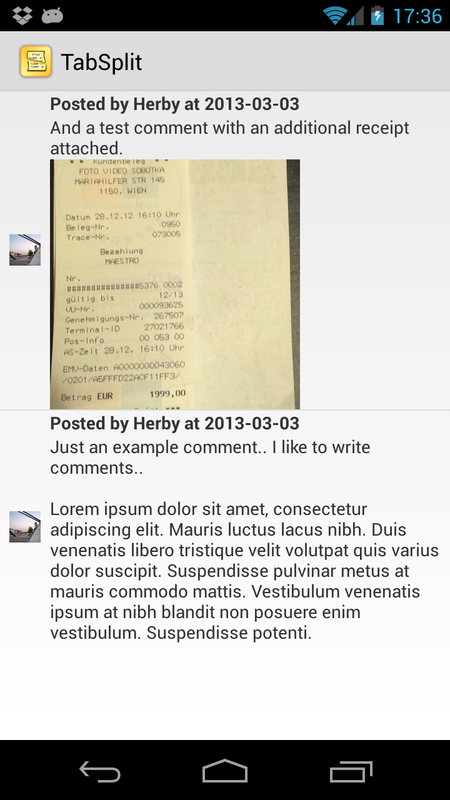 Posted February 11, 2013 by Herby & filed under Android App, TabSplit News. 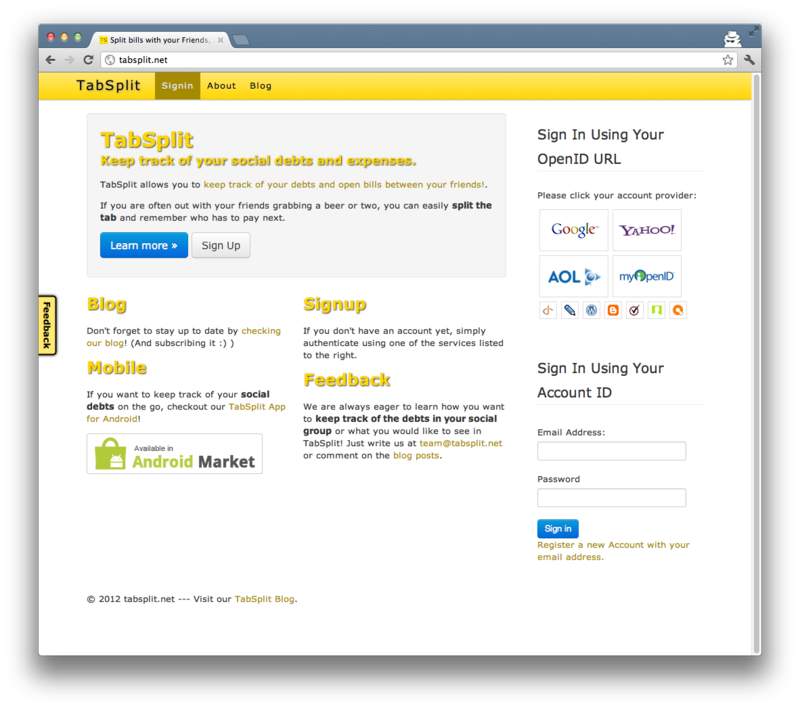 TabSplit now uses SSL encryption for all pages and is from now on only available at https://tabsplit.com/. Because of this switch you might need to reauthenticate TabSplit with your Open ID provider. We have also just published a new Android App Version (1.5.6) which uses https encryption and can be downloaded from the Google Play Store. As always, drop us a note in the forum if you experience problems or just want to provide feedback. You can also reach us on Facebook and Google+. Posted September 2, 2012 by Herby & filed under TabSplit News. Posted March 20, 2012 by Herby & filed under TabSplit News. It should be much cleaner and a bit tidied up and is finally consistent with this blog. 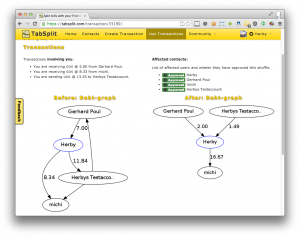 The main advantage is that we now have more possibilities on how to structure navigation, etc. It should also work much smoother on mobile devices. Hope you like it. Posted March 16, 2012 by Herby & filed under TabSplit News. We just launched a new feature called “Context Groups”. It is still under heavy development, but it will allow you to create so called “Context Groups” which allows you to give your transactions, expenses and contacts some more context. In it’s simplest form it works very much like tags. You simply attach them to your transactions. But, they are much more powerful. In it’s basic form only you will see these tags, but you can configure them within Contacts -> Context Groups and invite other people into your context groups. You will already have some basic statistics about how many transactions are within a context group, and how much you have spent in total. In the future we want to significantly improve the statistics feature – so you can see how much you’ve spent in a given context – like on a holiday, or for a given hobby, etc. There will also be a feature to add all contacts from a context group to a transaction or configure a different default currency for a context. These Context Groups are currently only available in the web application, but expect them to be soon available in the Android App as well!